Update April, 2019 – Unfortunately we can no longer recommend Carbon Poker for playing US poker online. Instead, we recommend checking out our top rated US site, BetOnline. Carbon Poker is the most respected and longest established skin on the Merge Gaming Network – having been formed in 2006 and joining the network in 2007. Without signing huge stars to promote itself or offering unrealistic bonuses, Carbon Poker has grown into one of the biggest US facing online poker sites by offering players a fair gaming platform, a secure playing environment and a lucrative VIP program to reward players who remain loyal to the site. Top quality software and an excellent range of promotions enable players on Carbon Poker to enjoy a superlative online poker experience and, for a limited time only, players can take advantage of an exclusive welcome bonus when signing up for an account at Carbon Poker through PokerSites.us. That´s right! In addition to the amazing Carbon Poker bonus of 200% on your first deposit up to an amount of $5000, players using our Carbon Poker bonus code FREE10PK will also receive ten $1.00 tourney tickets. The Carbon Poker bonus is not only one of the world´s most substantial online poker bonuses, it is without doubt one of the simplest to convert into cash. Carbon Poker awards VIP Points at the rate of 10 per $1.00 raked in cash games or paid in poker tournament entry fees, and releases a $5.00 increment of the outstanding bonus into your account each time you collect 375 VIP Points. To indicate just how easy it is to redeem the Bonus with for instance a first deposit amount of $750, we have provided a section on “Clearing the Carbon Poker Bonus” bonus below and believe that you should be able to clear the welcome bonus within 150 hours. As you are allowed 90 days in which to clear the Carbon Poker bonus, this works out at the equivalent of 1 hour and 40 minutes each day – a bonus which is achievable by most recreational poker players. By using our link at the bottom of this page you will be able to access the Carbon Poker web site and start the download. By using our link combined with our bonus code FREE10PK, you will receive the exclusive offer of 200% up to an amount of $5000 plus ten $1.00 tournament entry tickets. Once your download is finished, and you have completed the simple account registration process, you first need to verify your email address (to prove you are a human) and then you can enter the poker client. Click the red deposit button at the top right hand side of the poker lobby and be taken to a secure web page where you will be asked to select your preferred method of deposit. Different payment options exist for residents of different countries. You cannot make your first Carbon Poker deposit until you have verified your email address. Furthermore, you should check by clicking on the withdrawals button that you can withdraw your funds using the same method as you used to make your first deposit, as some payment methods have very high minimum or very low maximum limits applied. Once in the deposit page, enter the amount you wish to deposit and the 2019 Carbon Poker bonus code FREE10PK to take advantage of the 200% match bonus up to $5000.00, receive ten $1.00 tournament tickets, and gain access to Carbon Poker´s free odds calculator and the “Drag the Bar” poker training program. Clearing the Carbon Poker Bonus as a cash game player should present no problem – even for recreational players – as there is plenty of traffic at all but the highest stake levels throughout the day. On a typical $1.00/$2.00 6-Max NLHE table, with an average pot value of $20.00 ($1.00 raked), a player of respectable standard will participate in 25 or so hands an hour and earn 125 VIP Points in that time. Multi-table four tables at a time and you could earn the points to redeem the Carbon Poker bonus within 150 hours! Tournaments players will find it just a little harder to clear their enhanced bonuses on Carbon Poker and it is recommended that players multi-table $20.00 + $1.60 “Double or Nothing” Sit n Gos when they make their first deposit of $500.00. If you were to start sets of two Sit n Go tournaments on Carbon Poker every twenty minutes, you will collect 96 VIP Points per hour for your tournament entry fees and – as your bankroll increases with winnings from the tournaments and the bonus increments – you will be able to move up the stake levels until you are playing in $75.00 + $7.00 Sit n Gos and clearing 420 VIP Points per hour. 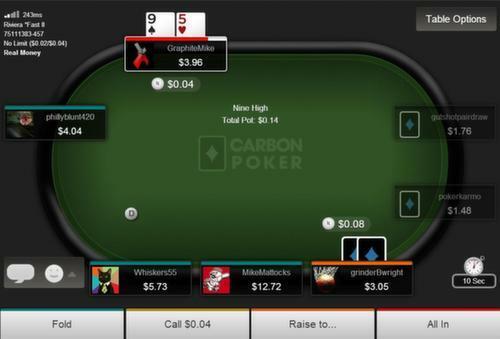 Carbon Poker was the first US-facing site to launch a mobile-friendly browser based mobile client which works for both Android and iPhone mobile devices. Currently it is only available to existing Carbon Poker clients (there is no facility for new players to register an account) and offers a limited range of games but, as the popularity of mobile poker grows, no doubt the client will be upgraded to support much more action. Once you have created your account on the “regular” web browser, you can access Carbon Poker´s website and you will automatically be redirected to the mobile version at m.carbonpoker.ag (from your mobile device naturally). You will be prompted to log in with your newly created username and password and show you whichever games are in progress at the time. Banking at Carbon Poker is secure and straightforward and for players outside of the United States there are a huge range of deposit and withdrawal options depending on your country of residence. MasterCard and Visa transactions are conducted using e-wallets and you can also deposit into your account by bank transfer, eWallet or prepaid cash voucher. Players in the United States are recommended to deposit by Western Union and withdraw by check, although the deposit method is not instant and it could take three weeks until you receive the funds withdrawn from your account. In order to accelerate the withdrawal process, we suggest players verify their accounts immediately after making their first deposits. The account verification process should not be confused with the verification email which is first sent to you when you create your account (to prove you are a human) and the instructions for verifying your account and a link to the form you need to complete can be found on the support tab of the Carbon Poker web site. Uploading your verification documents is done from the cashier tab along the top of the lobby. Once you have completed the procedures necessary to perform the Carbon Poker download and created your account, the choice of poker games that is available to you will more than make up for the effort you have put into playing on one of the best US facing online poker rooms. In addition to multiple disciplines of Hold´em, Omaha and Stud, Carbon Poker caters for players who enjoy the less-common games of Triple Draw, 5 Card Draw and Badugi. There is also an excellent choice of mixed poker games and if that was not enough to satisfy the most demanding appetite, the Carbon Poker software enables you to create your own custom games and invite your friends to compete against you. Despite the high volume of choices on Carbon Poker, the easy-to-navigate lobby provides straightforward access to the cash table or poker tournament of your choice at the stake level you wish to play. In addition to a wide range of cash games taking place all the time, there is a good selection of poker tournaments with guaranteed prize pools which, at certain times of the day, can be undersubscribed and represent excellent value to the observant poker player. The feature tournament on Carbon Poker is the weekly $125,000 guaranteed freezeout. The buy-in for this tournament is $109.00, but there are a large number of satellites hosted throughout the week – some guaranteeing seats which are undersubscribed – a freeroll which guarantees 125 seats to the target event which you can enter if you have earned 250 VIP Points in the previous week, and you can also buy directly in using the VIP Points you have earned in pursuit of your bonus without it affecting the likelihood of clearing the full amount of your bonus in the least possible time. 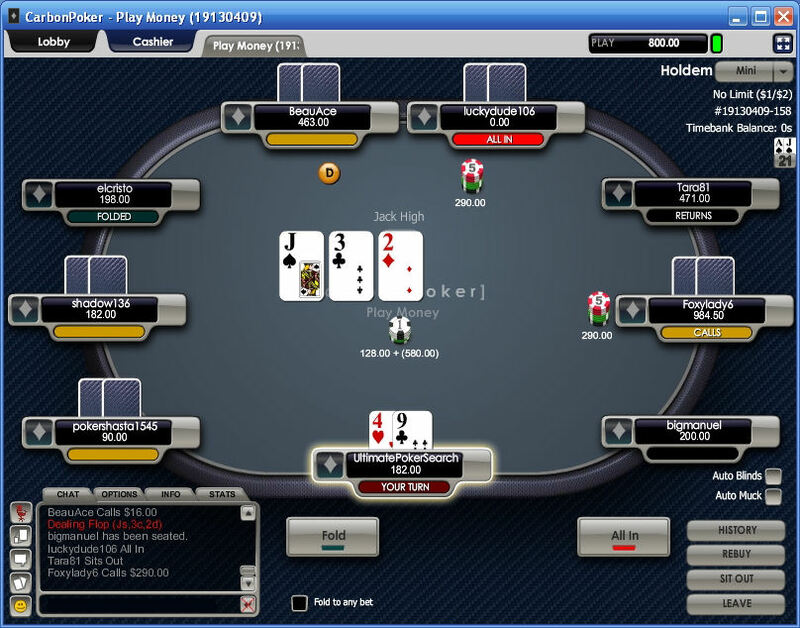 Being affiliated to the Merge Gaming Network generally indicates that the standard of play on Carbon Poker is fairly soft and, with the departure of Lock Poker from the network, the cash game tables at the higher levels – the ones you will need to play on in order to clear your bonus – have become easier to beat. Many of the tournaments provide an opportunity to seriously enhance your bankroll and it is possibly only at the higher levels of the Sit n Go tournaments – those which players like you are using to clear the Carbon Poker bonus in the safest possible manner – where you might find a tougher level of competition. Of course, playing against weak players is not always a good idea if you want to avoid bad beats and suckouts, but at least Carbon Poker caters for this unsavory occurrence by providing a special “Bad Beat Jackpot” where you, and those playing in the hand with you, collect a bonus if your hand of quad Deuces or better comes second at showdown. Indeed, Carbon Poker holds the record for the largest ever Bad Beat Jackpot payout when, in February 2009, seven players shared in a $1.2 million jackpot. Being part of the Merge Poker Network, many of the cool features that come with the Carbon Poker download – such as “Deal it Twice” and “Rabbit Hunt” – are not exclusive to Carbon Poker and, even though Carbon Poker is one of the most successful skins on the Merge Network, their hands are tied when it comes to introducing innovative features for the exclusive use of their clients. Happy Hours enable players to collect VIP Points at an enhanced rate and, once your initial Carbon Poker bonus is cleared, the site also offers an ongoing reload bonus of 75% up to $375.00 for which the Carbon Poker bonus code changes every month – so you will have to keep visiting CarbonPoker.ag to find out what it is! The lack of any Customer Service beyond email support is deplorable for a site of this size. The “Drag the Bar” poker training program is only available to those earning 10,000 VIP Points or more per month. Carbon Poker´s VIP Program lets you convert the points you’ve earned into tournament entry tickets. Over $30,000 is up for grabs for the top achievers each month. Very proactive in outside forums answering player questions and providing support wherever possible. 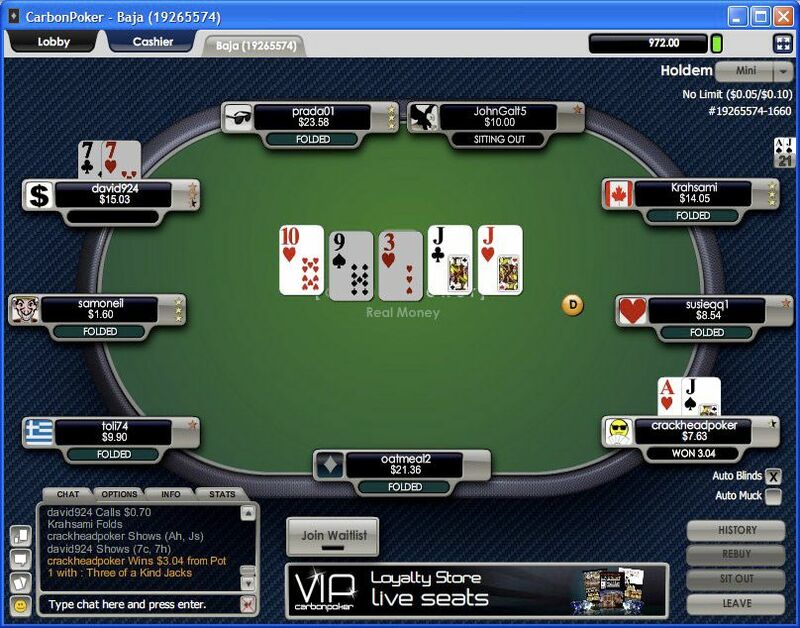 Add some customer support and they would be far and away the best US-facing poker site. If you can get past that point, the site prides itself on its security and integrity, welcomes new players in a thoughtful way and provides them with a genuine opportunity to win money on a fantastic range of poker games and clear bonuses in the easiest possible fashion.